Everything evolves, especially fashion. So many of us love vintage because modern fashions have evolved in a way may not always suit our tastes. Truthfully, I feel my most beautiful when I am wearing a vintage dress. I love the way it fits on me (when it does fit on me) and I love the way so many of them compliment my figure. My favorites are the shirt dresses that leave plenty of room for all the goodies that motherhood has given me. But finding them has been harder and harder to do so I was left with a predicament. Do I give up dressing up in vintage or do I allow my style to evolve? I can share with you now that I have chosen to evolve and you are going to see a lot more of that here. You can also see more of it on my Instagram HERE. Please stop by and say hi! So as much as I admire and drool over the vintage babes who dresses old school head to toe my current lifestyle demands something else. I may have said it before but practicality and comfort have to be in my style equation. I think if you are trying to find your sense of style definitely think about the life that you lead at that moment and how your style can fit into it. Walking around like a 60's housewife in bouffants and cat eyeliner just isn't jiving with my day-to-day living. And although I may not dress up every single day I do still dress up, just a little bit differently. 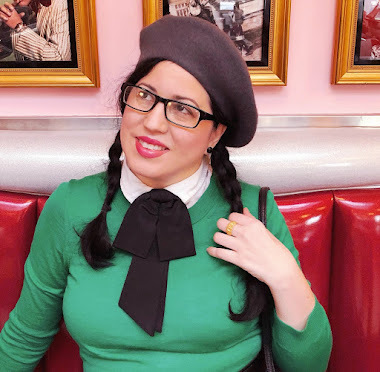 I have been experimenting with what aspects of vintage fashion that I love that I can acquire in order to create a look or looks that suit my life where it is as well as express who I am and display my lifelong passion for vintage. Cardigans, Collars, and Bow Ties. They make me happy, I feel really comfy wearing those pieces and I can wear them with skirts or jeans or dresses and oh my. You'll be seeing more of my experimentation in the coming months as I am working on collecting the pieces I need to help me create the looks I desire. 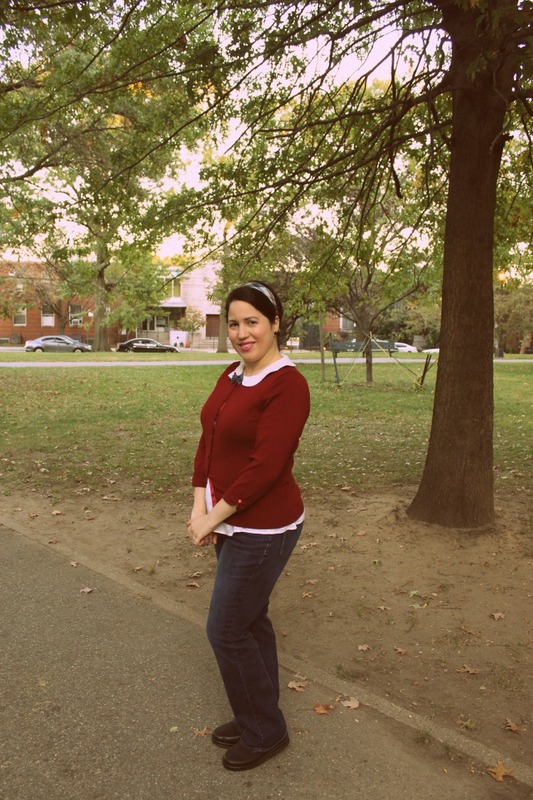 The photos in this post are a little experiment I did with my Boden Peter Pan collar blouse, Maurice Burgundy Cardigan, and regular pair of jeans. I simply grabbed one of the hair bows I purchased at Claire's Accessories and clipped it right in. I added a pair of vintage stud earrings and a vintage plaid headband all from the 1960's and there you have it. I felt comfy and cute and fancy free. What do you think? Any recommendations as I continue on my style journey? And remember, you don't have to dress pure vintage or reproduction to be a vintage girl. Old fashioned values, appreciation for the past, and love for history are all inside of you. This is great! I can relate, I too have let my vintage style evolve. Even though I would like to stick with 1940s fashion I tend to look more 1950s. Plus I like super hero's such as Captain America and Superman. I'm not a t-shirt fan but I adore socks and this is where I allow myself the joy of adding my fandom for super hero's to flourish. And I buy vintage inspired clothing too my favorite place to shop is at Kmart and Payless, online favorite is shop national. I absolutely agree that comfort is a must. A vintage vanity and Chronically Vintage on youtube have posted videos on how to dress vintage with inspired clothing. This is going to be fun to see how your style evolves. This is such a pretty outfit! I've said it before and I will say it until the end of time, I strongly believe that one's love of vintage resides first and foremost in the heart. If you want to/can wear vintage, great, if not or if your wardrobe is a blend of new and old, awesome, too. One does not have to sport period appropriate garb everyday (or even ever!) to love vintage and be a part of the community in the slightest. It's great that you can keep your love of old school styles alive in creative, fashionable ways still, dear gal. Good for you!!! Vintage inspired is the best, and you look adorable, but still unmistakably you. I really love this look! As I've tried to "get into" vintage fashion, I just can't leave jeans behind, and I don't think I ever will, so I love seeing how others mix up jeans and other elements. And the little bow is a great touch!